Are you looking for some fun ideas to keep the kids occupied this spring and summer? Kids of all ages love STEM activities. They tend to be very hands-on, allowing kids to be creative and have fun, all while learning. Even preschoolers can get in on the fun when it comes to making these plastic egg submarines. Affiliate links have been used below. See my full disclosure here. Plastic egg activities like this one are lots of fun. 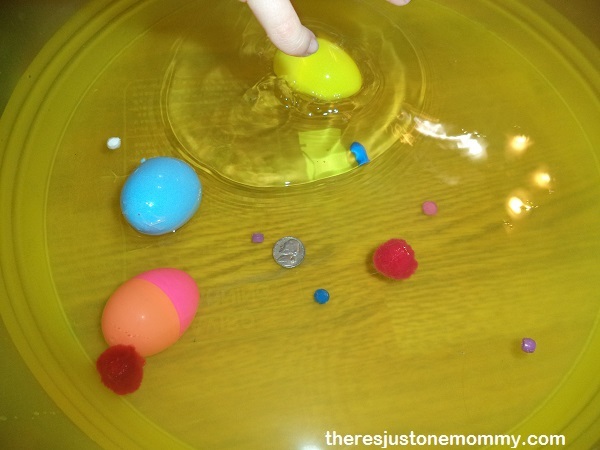 Making these egg submarines with plastic Easter eggs was a huge hit with my preschooler. It was a fun way to play with water for the letter “S” in our preschool vehicle activities for the alphabet. 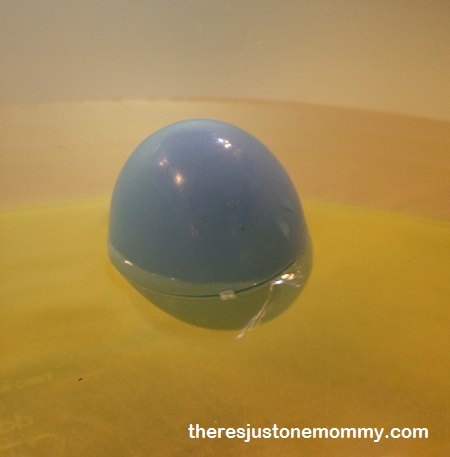 This activity was inspired by this Sink the Easter Egg activity. I had a collection of beads, pom-poms, pennies and quarters on hand to use to help sink our plastic egg submarines. We used 4 eggs and rolled a game die to see how many of each object would go into each egg. We soon discovered that the pom-pom egg floated at the very top of the water. The one with a few beads was also at the top. The submarines with pennies and quarters sank part way. How do you get a plastic egg to sink? We tried completely filling one egg with the pom-poms, one with beads, one with pennies, and one with quarters. Before placing our submarines into the water this time, we put a few of each item (pom-pom, quarter, etc.) into the water. The preschooler noticed that the pom-pom and some of the beads floated, while the coins sank right away. We talked briefly about why that may be. Then we tried our newly filled eggs. The preschooler was very happy to see the penny and quarter-filled egg submarines sank to the bottom. When he realized the bead and pom-pom ones were still not sinking, we talked about how the plastic eggs still had air in them, helping them float. Then we tried filling those spaces with water — success! The plastic egg subs all sank. The preschooler continued filling eggs, watching them sink or float while I prepared lunch. He asked to continue the play after lunch, too. 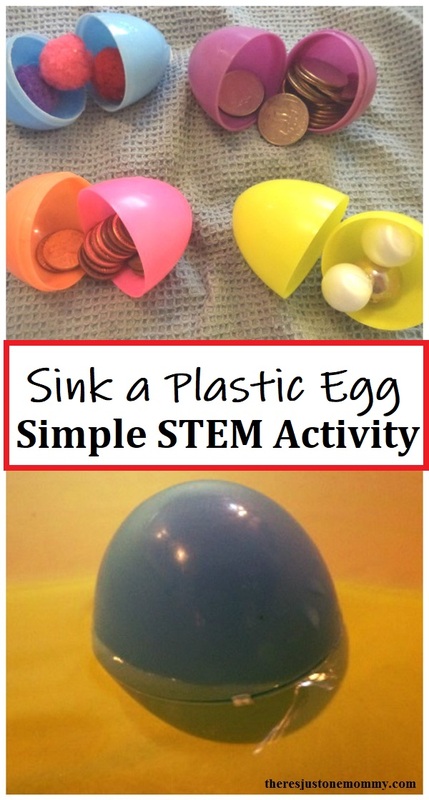 Plastic egg submarines are a simple sink and float science activity that your preschooler will love. Originally published April 22, 2014. Water play is always fun! My daughter is a big fan of float-or-sink activities – she would love this one! This is such a fun idea! I do have lots of eggs leftover! Oh we just got some plastic eggs super cheap and my three year old will love doing this with them! Thanks so much for the inspiration!! what great ideas…so hvae to try this. Again, you have another fun activity I’m sure littles will love. Thank you for always sharing such fun ways to learn. We appreicate you at Mommy Monday! This is such a clever use of plastic eggs! Thanks for sharing at After School! We enjoy float or sink activities. I’m not a preschooler but I agree it’s not a submarine unless it sinks.